It is often said that our society is consumer driven, or that we live in a consumerist culture, increasingly dependent on things we can buy rather than things we can create on our own. Despite this, a growing countermovement persists. Referred to as maker culture, this movement not only seeks to build community of tinkerers, builders, artists, and general DIYers but to demonstrate and give others the tools to become makers themselves. Locally, furthering momentum in the growing maker movement is the upcoming fifth annual Maker Fest from the St. Paul Public Libraries. This Saturday, June 17, St. Paul’s Sun Ray Library will play host to “artists, crafters, technologists, and tinkerers” looking to share their creations and crafts with the public. “There’s no particular genre,” Andrea Herman, chair of the team responsible for organizing the Maker Fest, told Twin Cities Geek. The goal is to “find people out in the community with skills who would be willing to teach what they know.” Participants in previous Maker Fests have gone on to teach community classes for SPPL leading to programs such as Tinker Tuesdays, in which people learn hands-on skills such as book making, jewelry crafting, and iPhone photography. The event “will have 10 to 15 presenters,” Herman explained, “presenting from booths people can walk up to.” With that, the Sun Ray Library is prepping for between 400 and 500 attendees. Drawing from individuals and community organizations, this year’s activities will include making books with the Minnesota Center for Book Arts, Somali hand weaving, henna, making bird feeders, T-shirt screen printing with Elpis Enterprises, crochet, chainmail key rings, marshmallow launchers, giant coloring pages and papercrafts, “Play Tinker Make” with the Science Museum of Minnesota, and many others. So if you hope to fan the flames of your inner DIYer or are simply looking to pick up a new skill, make a point to check this event out. 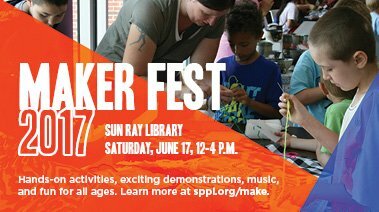 Maker Fest is Saturday, June 17, at the Sun Ray Library from 12:00 to 4:00 p.m.